Where can I download free fonts and typefaces? Well, The Pyte Foundry is an interesting, and useful, typographic resource to add to your collection if you like collecting free fonts and typefaces. You’ll no doubt notice that they use ‘alternative’ spellings on their website, such as: Pyte for Type, Gidital Typefaces for Gigital Typefaces, Fount for Font, Pytographic for Typographic… etc. 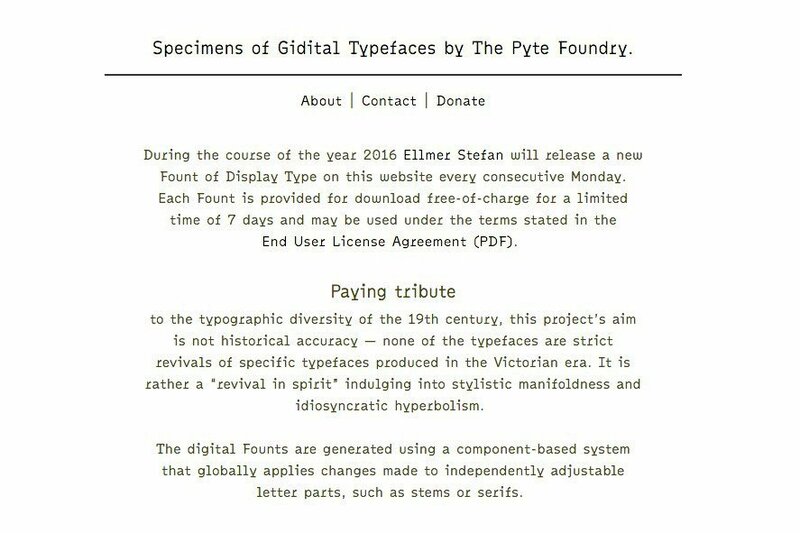 Each consecutive Monday, Mr Ellmer Stefan will release a new font on The Pyte Foundry website, which will be provided for download free-of-charge for a limited time of 7 days, and may be used under the terms stated in their End User License Agreement (PDF). As you can see from the screenshots, each previous font shows when it was made available, but after 7 days the download link is deactivated. As of writing this post; No. 28 ‘Overdose’ is the current free font available for download. 0% fat in tha face. Quickly going back to their alternative approach to spelling, their sign-off on the About page (below) made me smirk: Alas, enjoy! 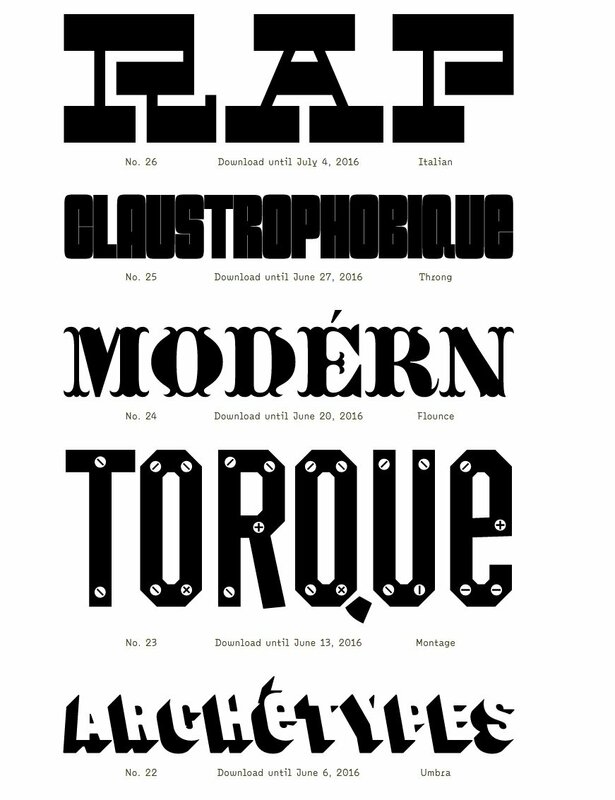 The Pyte Foundry: During the course of the year 2016 Ellmer Stefan will release a new Fount of Display Type on this website every consecutive Monday. Each Fount is provided for download free-of-charge for a limited time of 7 days and may be used under the terms stated in theEnd User License Agreement (PDF). 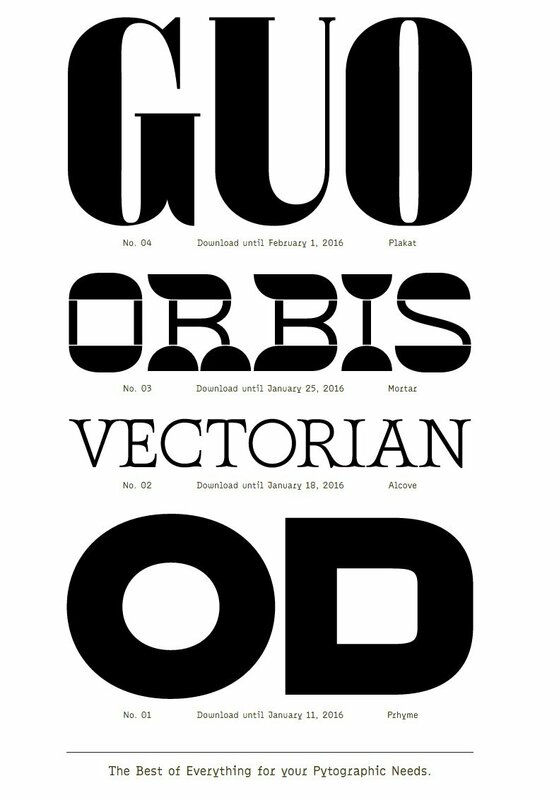 to the typographic diversity of the 19th century, this project’s aim is not historical accuracy — none of the typefaces are strict revivals of specific typefaces produced in the Victorian era. It is rather a “revival in spirit” indulging into stylistic manifoldness and idiosyncratic hyperbolism. The digital Founts are generated using a component-based system that globally applies changes made to independently adjustable letter parts, such as stems or serifs. 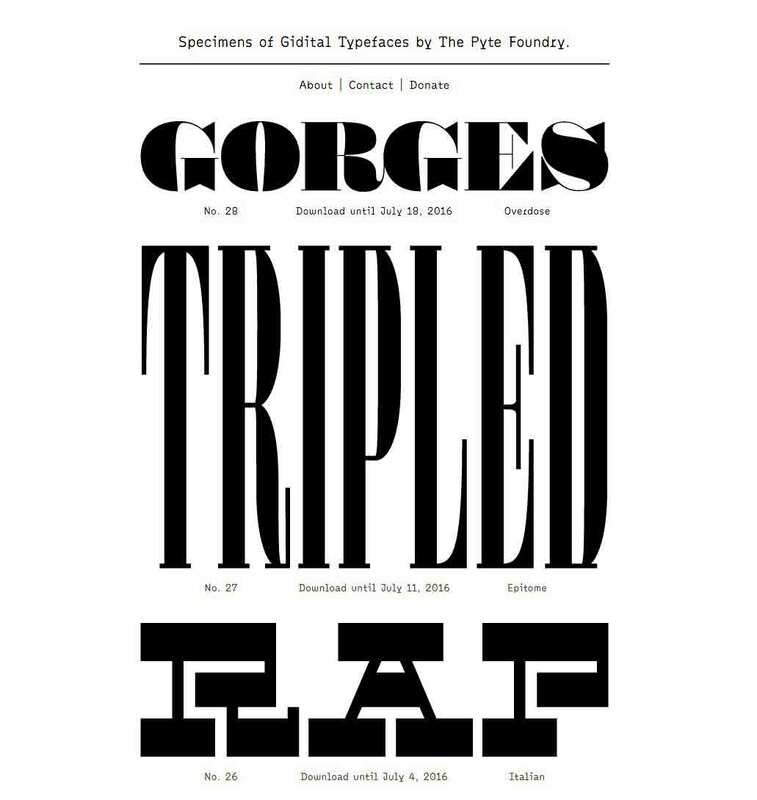 This approach mirrors the production methods envisioned for the making of wood types around 1880: in “American Wood Type 1818–1900” historian Rob Roy Kelly refers to a series of inventions byWilliam H. Page using interchangeable modules in the creation of wood type letters enabling the rapid manufacturing of new styles.